After over a year of messing with Jim's WM20 and becoming inextricably drawn into the world of side-valves and ex-WD bikes I suppose I didn't have a chance. I was accompanying Jim on another WM20 hunt - this time to a farm two and a half hours from my home. 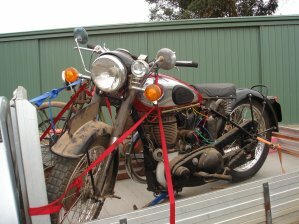 He had heard that there was a WM20 parts bike which would help him complete his own restoration (see Jim's WM20 restoration). We travelled to the farm, the deal was done for the parts bike. Then I saw the M21. I've always wanted one of them! To say I've always wanted an M21 wouldn't be really accurate. They're not really the stuff of motorcycling fantasies! 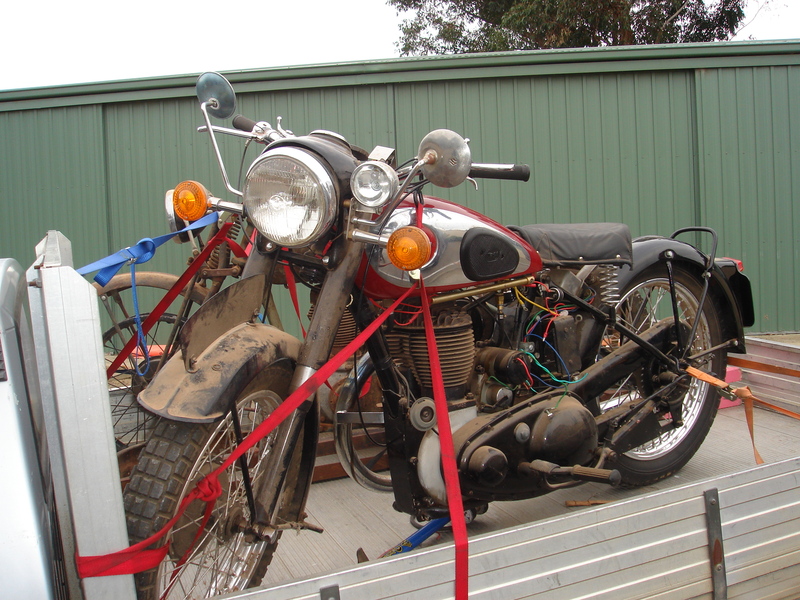 However this M21 was sitting in a dusty open shed with a sidecar attached. The owner wouldn't part with the sidecar so after a price was agreed we spent half an hour unhitching the chair before she could be loaded up. I had the word of the owner that he bought it in 1987, rode it around the paddock then parked it in the shed. It hadn't been started since. I decided it was worth the gamble - I bought it without even kicking it over. Once home I knew that I had made a good purchase. The bike was substantially complete (those spotlights and indicators would have to go!) and under the dirt things seemed to be okay. There was evidence of a restoration - the previous owner said it had been restored in the 1980s but time and corrosion had been active. Would she start? I checked the oil. Not much in evidence. Probably all drained to the sump by now. I unscrewed the sump plug and a cupful of dark muck came out. I topped the oil tank up with some supermarket 25W/50. The petrol tank contained a foul smelling brew - so bad that we had to open the shed door after I undid the tank cap! I would know whether it sparked soon enough. Clean out the carby? Probably will have to but impatience got the better of me.I climbed on, tickled the carb to move some of the evil smelling fuel from the tank to the carb. Advanced the spark. Hold on, is this the choke or the advance retard? No, all is correct. Leave the choke alone - these side-valves don't usually need a choke. Take her up to compression, over the top with valve-lifter, swing. Thump-thump-thump-thump. She started first kick! With a running bike I now had two options. 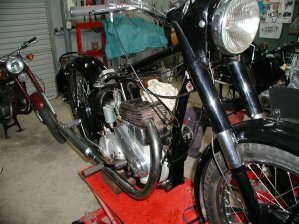 Continue with the restoration or head out and ride the bike. There was really never any question. The same night that I started the bike I took a set of sidecutters and removed every trace of the spaghetti wiring loom and threw it in the bin. That done, there was no turning back. The wiring loom on a bike always tells a story. 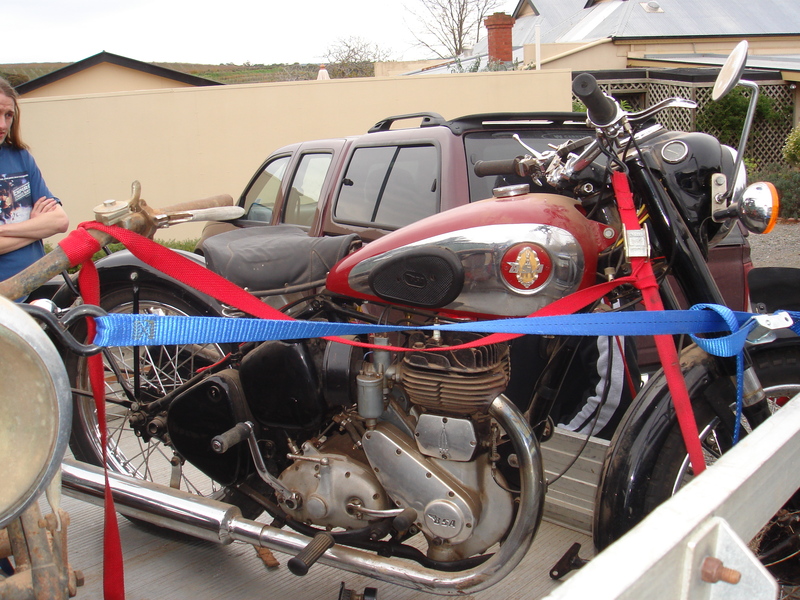 This bike may have been restored at some stage but wiring was not one of the restorer's strong points. Bad connections, mismatched wires and haf a mile of electrical tape were in evidence. A full, nut and bolt restoration was in order.